Despite the hype about smart cities, and the availability of EU funding, there are very few projects out there that qualify for funding, according to Lada Strelnikova, lead fund manager at the European Energy Efficiency Fund (EEEF). An exception: Belgian bank Belfius has, with the support of the European Investment Bank (EIB), provided €1 billion to smart city projects involving more than 100 municipalities in Belgium. According to Joost Declerck of Belfius, the market for smart city solutions is growing – and if the banks don’t jump on it, the Googles and Amazons of the world will. Smart cities have featured on the European policy landscape since 2012, when the European Commission launched the EIP-SCC (European innovation partnership on smart cities and communities). 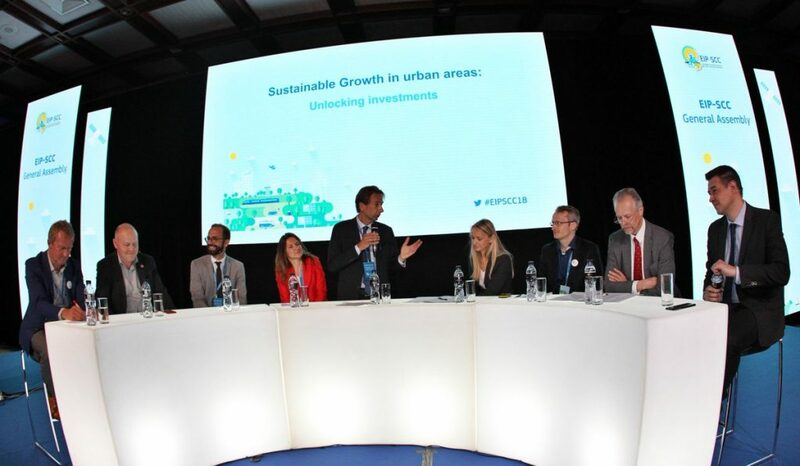 Working with cities, industry, SMEs, banks, academia and citizens to design and implement sustainable urban projects, the EIP-SCC provides a marketplace for bankable smart city solutions. It is aiming to facilitate investment of at least €1 billion involving 300 cities by the end of 2019. However, most of the smart city projects so far have been kickstarted with European public funding, and the challenge now is for smart cities to attract investment from other sources. Funding is available from, amongst others, the European Energy Efficiency Fund (EEEF), but the project pipeline is slow to build, says Lada Strelnikova, lead fund manager at EEEF in an interview with Energy Post. “So far we haven’t seen any truly integrated projects. These types of projects are definitely being considered, but remain fragmented,” says Strelnikova. Funded projects to date are mostly streetlighting retrofits, she says, with “a smart city component, such as daylight sensors and routing through WiFi for parking”. Most of the smart city projects so far have been kickstarted with European public funding, and the challenge now is for smart cities to attract investment from other sources. Replacing a legacy street lighting system with LEDs can reduce a municipality’s energy bill by half. Upgrading to a ‘smart’ solution, by integrating those lights with networking and intelligent controls can provide a further 30% in savings – and also provide a platform for current and future smart city applications such as environmental/air quality monitoring, traffic monitoring, smart parking and more. To help address this, EEEF provides technical assistance to help smart city project promoters develop bankable proposals, and “we need to expand this” says Strelnikova. “Many are interested in smart city development but don’t know how to implement it and lack the human resources to drive the process. The notable exception to the trend is Belgian state-owned commercial bank Belfius, who with the support of the European Investment Bank (EIB) launched the Smart Cities & Sustainable Development programme in 2014. Under the initial programme, Belfius provided €400 million (€200 million each from EIB and Belfius) to 62 smart city projects over two and a half years. “Our aim was to provide attractive funding for innovative solutions,” says Joost Declerck, energy efficiency promoter at Belfius bank, in an interview with Energy Post. “Also, our funding is flexible – project budgets go from €60,000 up to €20 million,” he says. Other support measures from Belfius include an annual smart city award scheme, and guaranteed publicity for each project. Many are interested in smart city development but don’t know how to implement it and lack the human resources to drive the process. But there are exceptions. Rural municipalities have also benefited, adding a new dimension to the concept of smart city development. Located in the Province of Hainaut in Belgium, the municipality of Silly was awarded funding for two projects, the full redevelopment of Square Camille Theys in the village of Bassilly and the installation of 42 photovoltaic panels on the main building of the municipal school in Graty. Silly is a member of the international Cittaslow network (a combination of the Italian word for city ‘città’ and the English word ‘slow’), which is inspired by the ‘slow food’ movement. Member cities (with less than 50,000 inhabitants) aim to foster a slower pace of life, by reducing energy consumption, promoting clean energies, retrofitting existing buildings, creating green spaces, leisure areas and greenways and giving priority to non-polluting modes of travel and public transport. “Our role is to invest in Belgian society, and to bring profit for the society,” says Declerck. Indeed, Belfius is particularly well placed to lend to public authorities. All Belgian municipalities hold accounts with Belfius and the bank is also the market leader in lending to public authorities. Belfius emerged in 2011 from the post-crash dismantling of the global Dexia Group, whose holdings included the former Gemeentekrediet van België / Crédit Communal de Belgique founded in 1860, specifically for the financing of local authority investments. At present, Belfius is 100% owned by the Belgian state, which acquired it for €4 billion in 2011. Buoyed by the success of the initial smart cities’ programme, in late 2016 Belfius and the EIB committed an additional €400 million to a broader programme, ‘Smart Cities, Climate Action & Circular Economy’, extending to include education and health care sectors, and aiming to make investments “circular” in nature. Market uptake has been strong, with the result that total smart cities lending in Belgium is now approaching €1 billion investment. Citing several of the well-established challenges of energy efficiency financing, such as lack of standardisation, small project sizes and uncertainty over returns on investment, Declerck says: “We see a lot of potential, a lot of need, but a lack of know-how.” Most of the lending to date is through third parties, typically associated with energy service companies (ESCOs). The market for smart solutions is growing more and more, and if the traditional banks do not offer services here, Google or Amazon or someone will. Declerck sees it as necessary for the bank to provide a ‘one-stop shop’ for sustainable development lending, and envisages action plans to address targeted interventions in each sector: “You could have an action plan dedicated to putting photovoltaics on the roofs of all public buildings, one to tackle energy efficiency in the school system and in retirement homes, for example,” he says. To this end, Belfius have applied for a further technical and financial support line (ELENA – European Local Energy Assistance) with the EIB to fund an in-house specialist team (project development unit), which would essentially be a “team of commercial experts, project developers who can package a deal and put together action plans for each sector,” according to Declerck. The aim is to establish the project development unit by January 2019.